Named from the Stelvio Pass in the Italian Alps, the Alfa Romeo Stelvio SUV is uniquely Italian, offering luxurious comfort and adrenaline-pumping performance. As Alfa Romeo’s first SUV, each detail of the Stelvio was meticulously crafted to exemplify its elegance, sophistication and power. While delivering the capability you expect from an SUV, its sports car performance will leave Vienna drivers rethinking everything they thought they knew about a Sports Utility Vehicle. Italian crafted from the inside out, those lucky enough to find themselves behind the wheel of the Stelvio will immediately be greeted with space and comfort. This high-class Italian-style interior is topped off with none other than a leather wrapped steering wheel and elegant leather seats while the race-inspired exterior is set off by the iconic “Trilobo” front grille. Along with incredible power and beauty, the Stelvio is equipped with the highest-quality safety features allowing you to drive fearlessly on the Virginia roads. With an integrated braking system that enables you to stop on a dime and a standard back-up camera with parking sensors, drivers around Vienna can have complete confidence while performing even the most difficult maneuvers. 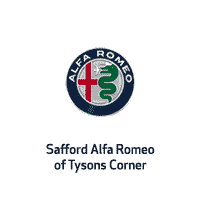 At Safford Alfa Romeo of Tysons Corner, we believe you deserve to relish in style and elegance every time you get behind the wheel for a drive. Visit our studio in Vienna, VA that represents the power and passion of Alfa Romeo vehicles and allow our product specialist to tell you all about our beautiful Alfa Romeo models like the Stelvio SUV. The Stelvio is only in its second year of existence on the automotive market, so it’s no surprise that changes to the 2019 version of the Alfa Romeo SUV are minimal. Most notably, Apple CarPlay and Android Auto are now standard features on every 2019 Stelvio trim level, and there is also now a rear-wheel-drive base model added. In total, there are four trims to choose from in the 2019 Stelvio Lineup: Base, Sport, TI, and TI Sport. Each one comes with an innovative all-wheel-drive system and a powerful 2.0L turbocharged engine under the hood delivering 280 horsepower and 306 lb-ft torque. If you’re looking for a truly unique offering in the sport utility segment, then the 2019 Alfa Romeo Stelvio should be at the top of your consideration list. Inside, Vienna drivers will find a well-balance mixture of sport and luxury. Varied by model, upper level Stelvio trims flaunt Alcantara 12-way power front seats, a leather-wrapped instrument panel with accent stitching, and carbon-fiber trim leather seats. Carbon-fiber-shell Sparco racing seats with manual adjustment are also available on the Quadrifoglio. As essential as power and luxury is to the Alfa Romeo Stelvio, safety is also indispensable. With features that put the driver in control, you can have unbreakable confidence on any windy road. Along with a standard backup camera and rear parking sensors, drivers can add full-speed forward collision warning with automatic emergency braking, adaptive cruise control, lane departure warning, blind spot monitor, front parking sensors and rear cross-traffic alert. While being a SUV that only Italy could create, the Alfa Romeo Stelvio is the epitome of luxury and power providing Virginia drivers with everything they need from a capable SUV, all in a sophisticated, deluxe package. Visit our Vienna, VA Alfa Romeo dealership today. As soon as you set foot in our studio, you’ll be overcome by the century of race history, passion and design that makes up the Alfa Romeo brand. Our friendly staff will go over every aspect of the Stelvio, answer any questions you may have and get you behind the wheel for a drive you won’t soon forget.